Dentistry student Dania Alkhani presents her research. Killing oral cancer cells was the goal. Figuring out how to do it was Dania Alkhani’s problem to solve. "We're getting there," said Alkhani, a fourth-year student in the College of Dentistry. "We've synthesized a compound that looks promising." Combining her background in medicinal chemistry with her ongoing education in dentistry, Alkhani set out to find a less invasive, more effective treatment for oral cancer for her table clinic project, a two-year research experience that is mandatory for all dentistry students at the U of S.
"Invasive surgery is the main method of treating oral cancer, or radiation therapy," Alkhani explained. "There really isn't a non-invasive and effective treatment. Our job was to find one." With the help of her supervisor Jonathan Dimmock, professor emeritus in the College of Pharmacy and Nutrition, Alkhani began formulating the project based on existing compounds and research. "One compound we synthesized was very potent," she explained, adding that due to patent proceedings they simply call it Compound Four. "It is 10 times more effective at killing some cancer cells than an anti- cancer drug currently used." 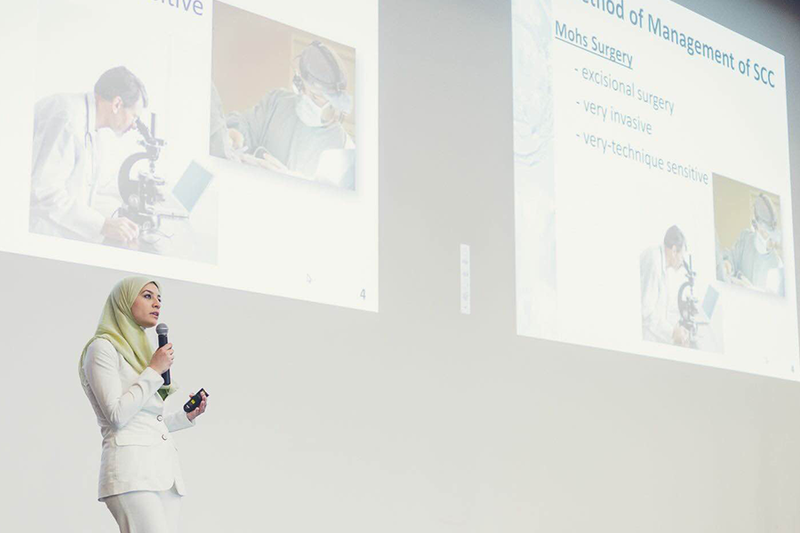 With such promising results, Alkhani began presenting her research at competitions. As one of the top research groups selected by the College of Dentistry at its annual competition, Alkhani then presented in front of the Saskatchewan Dental Society where she placed first. Then, beating out the top student research projects from the nine other dental schools in Canada, she won the national competition held by the Canadian Dental Association at the end of August—the second year in a row the U of S grabbed top spot. With a first-place finish, Alkhani won a trip to Washington, D.C., to attend the American Dental Association's 2015 conference where she will present her research. As for Compound Four, Alkhani said in order for it to become a candidate anti-cancer agent, as determined by Dimmock, it should be able to kill cancer cells at low concentrations and have a good selectivity index (at least 10), meaning the concentration of compound required to kill cancer cells needs to be much lower than the amount required to kill non-malignant cells. "Compound Four has already met the first criteria, but its selectivity index is 6.4, so we are working to raise that," she said, adding that professors in the Colleges of Dentistry and Pharmacy and Nutrition have supported and guided this work every step of the way. If the selectivity index is increased, she continued, then the efficacy of one or more compounds in treating tumors passaged in laboratory animals will be investigated. If this investigation is successful there are still many steps to be undertaken before a new drug is marketed. With less than a year left until graduation, Alkhani has to start thinking about her own plans too. "Being able to do this interdisciplinary research and collaborate with people in pharmacy was a great experience," said the Ottawa native. "Combining knowledge from drug synthesis and dentistry, my two passions, made me realize I want to continue to do both once I graduate. Having a practice and pursuing academia will allow me to do that."